NAPA’s Esme Kingdom and cast, during rehearsal. 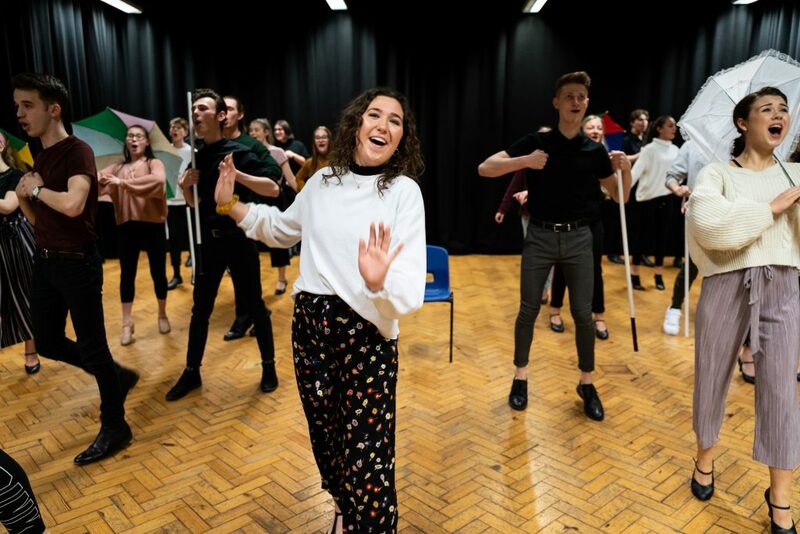 The Northern Academy of Performing Arts (NAPA) has established a reputation of putting on a phenomenal show each year at Hull Truck Theatre that showcases young talent from the local area. Hot on the heels of Betty Blue Eyes and Thoroughly Modern Millie, this year’s spectacular offering is the all-singing, all-dancing Hello, Dolly! Hilarious and moving, the storyline of Hello, Dolly! has been around for generations. The 1969 musical rom-com movie was based on the 1964 stage musical, which in turn had taken inspiration from a 1938 play that had origins in a one-act farce from 1835. However, the film directed by Gene Kelly and starring Barbra Streisand is surely the most iconic version, and its stage adaptation has been a popular favourite on Broadway and in the West End for decades. A rare treat, this classic musical is set to burst onto Hull Truck Theatre’s main stage from Wednesday 10 to Saturday 13 April. Set in New York City at the end of the nineteenth century, the mesmerising widow Dolly Levi, played by Esme Kingdom, has turned from socialite to matchmaker. Currently on her books are the grumpy “half-a-millionaire” Horace Vandergelder and a young artist who is in love with Horace’s niece. Though highly successful at firing Cupid’s arrow, this time Dolly has her own secret agenda that starts to cause unforeseen problems. What starts off as a flawless plan soon spirals into comedic chaos and musical mayhem. NAPA is no stranger to bringing the Big Apple to Hull, as last year’s Thoroughly Modern Millie was set there during the Roaring Twenties. Hello, Dolly! takes its audience even further back in time to the 1890s, the generation that was still rooted in Victorian discipline yet beginning to express itself in more lavish and energetic ways. As always, a first-rate creative team has worked meticulously to bring this fabulous tale to life for Hull theatregoers. Alongside Katie’s direction, choreographer Paddy Start, music director Paul Frankish and production manager Jamie Wilks have pulled out all the stops to make this a treat for all the senses. Tickets start from £15 and can be booked by calling the Hull Truck Theatre box office on 01482 323638 or online at www.hulltruck.co.uk. 1 Comment on "NAPA’s Hello Dolly! brings 1890s New York to Hull Truck Theatre"